At a LEED for Retail roundtable discussion in Serbia last month, this attendee poll resulted in 60 percent and 10 percent, respectively. While I was surprised by these numbers, I also saw firsthand the incredible excitement and potential for LEED to take hold here. Last month, I had the pleasure of traveling to Belgrade, Serbia to keynote this roundtable event, which was being hosted by our friends at Energo. 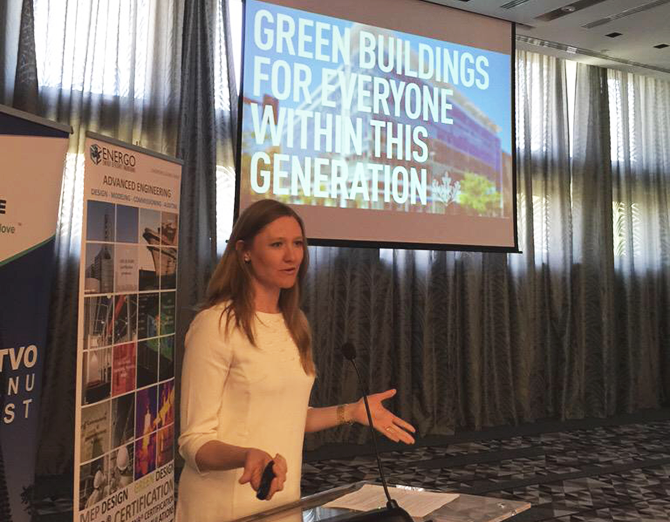 While Serbia may only have nine total LEED-certified buildings, the interest in LEED and the increase of activity in the construction sector in Serbia is highly promising. One prime example of that is the stunning LEED-certified Ušće Shopping Mall. Every day, 30,000 people pass through this mall, which is considered by locals as their “new museum”—a place not just for shopping, but for socializing and taking appointments. It’s become a de facto community center with many flocking to the mall because of the high air quality inside. USGBC estimates that 1.2 million people around the world experience a LEED-certified retail location every day. Retail spaces have unique considerations when deciding to certify to a green building standard. 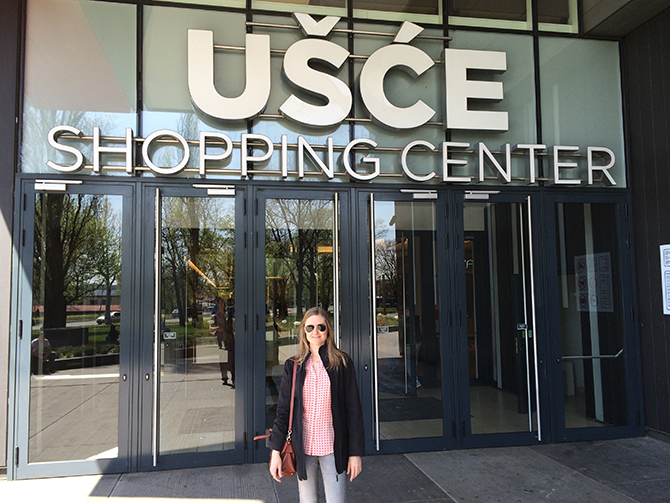 For the project team behind UŠCE Shopping Center, they had to convince 100-plus tenants that LEED was a good financial investment and an opportunity to provide a healthy space for their workers and customers. The LEED for Retail roundtable was attended by more than 40 people from companies like Ikea, Inditex, Mercator, Confluence, the Serbian government’s directorate of buildings, OMV, Henkel’s and representatives from the U.S. and Italian Embassies, to name a few. Retail spaces have a number of unique considerations when thinking about LEED—from occupancy demands to waste streams and energy and water use. USGBC launched LEED for Retail as a pilot in 2007 and then formally in 2010. Nearly 100 national and independent retailers and franchisees, including Bank of America, Best Buy, Chipotle, Wells Fargo, Citigroup, Kohl’s, L.L.Bean, McDonald’s, Pizza Fusion, Starbucks and Target participated in the pilot program. Today, LEED offers retail certification options for new construction, commercial interiors and existing building projects, giving retailers more solutions than ever. People: Consumers and investors are keenly aware of the positive impact, on the environment and on communities, that the corporate world is capable of making. LEED is a common language that carries the solid stamp of third party approval. Investors take this into consideration, and consumers are catching on. Plus, as profiled in the next section, LEED-certified retail locations prioritize human health: among their many health benefits, they have better indoor environmental quality, meaning customers and staff breathe easier and are more comfortable. In a business where customer experience is everything, this is particularly valuable. Planet: LEED-certified buildings outperform conventional buildings. Incorporating sustainability on a holistic level results in LEED retail projects using less energy and water. On average, Starbucks’ LEED stores use 30 percent less energy and 60 percent less water. One example from L.L.Bean: “A state-of-the-art lighting control system, occupancy sensors, an energy use management system and mechanical system commissioning contributed to reducing the [LEED-certified] store’s energy consumption by 40 percent over comparable facilities.” These trends hold true across the globe: the LEED Platinum Zara global flagship store in Rome uses 30 percent less energy, 70 percent less water, avoids 200 tons of CO2 emissions each year, and achieved 78 percent waste diversion during construction. Profit: Resource savings = costs savings. McGraw Hill Construction found that green retail owners saw an eight percent average decrease in annual operating costs, and a seven percent increase in asset value. Plus, in the competitive retail landscape, companies with solid evidence of corporate social responsibility stand out among other retailers, attracting customers and investors. Sustainable transport, which is an important aspect of LEED. All European cities are improving their bicycle infrastructure and commercial building developers are including showers as part of the natural work environment, to cater to bike commuters. “Although shopping malls dislike when their car spaces are limited, it is crucial to have good public transport infrastructure so that visitors can access the retail space without having to use a car. This brought us a lot of points while certifying Ušće,” pointed out Ms. Golubović, ENERGO. Water efficiency is also a crucial requirement considering the amount of water used in large public spaces. LEED offers various solutions such as automatic water taps, as were installed in Ušće, as well as waterless urinals. Some attendees expressed concerns on this issue especially regarding shopping mall owners’ skepticism about unpleasant odors, which is not the case in practice, as explained by GTC Croatia who are already using waterless urinals in their restrooms. Energy efficiency and its implementation was another topic. “It is one aspect to manage the public spaces, and another to manage tenants within our shopping mall,” explained Mr. Vraneš from MPC Properties. “Each tenant has their own practice and habits. We did a lot to raise their awareness on how to save energy.” Mrs. Milenkovic from OMV explained that they applied LED lights to all their properties: “It’s common sense for any company to want to reduce its energy usage.” Similarly, IDEA and Mercator representatives pointed out that using doors on the fridges as one of the steps to maximize energy efficiency. Roundtable participants were genuinely interested in what LEED has to offer and there is no better time than now. I left Belgrade super optimistic. Serbia’s building industry is going through a revival period, there is an interest in providing indoor spaces that are not only healthier for occupants but also spaces that use less energy and water and use fewer resources. These are new times for emerging areas that can learn from what has been happening in the U.S. and in other parts of the world in terms of green building. I hope to go back to Belgrade soon and see the progress that’s been made and celebrate the LEED certifications to come!